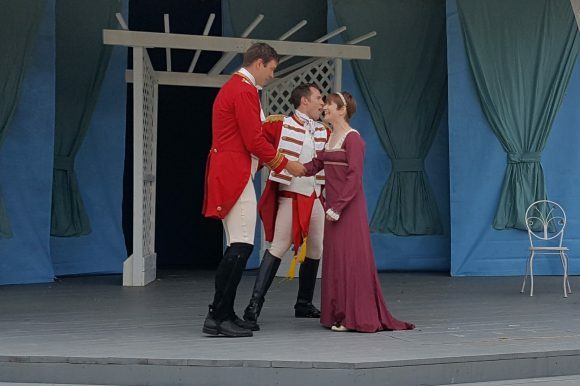 Making Much Ado About Much Ado About Nothing at the St. Lawrence Shakespeare Festival. Much Ado About Nothing sees wild-haired Leonato open his home to Don Pedro and comrades Claudio and Benedict following their return from war. Claudio and Leonato’s daughter, Hero, go googly-eyed for each other instantly while Benedict and Hero’s cousin, Beatrice, reignite their fiery antagonism equally instantly. While Don John, his comrades, and Hero work to trick Benedict and Beatrice to falling for one another, the villainous, dressed-in-black, Don John (brother of Don Pedro) schemes to ruin Hero’s reputation and undo her pending nuptials to Claudio for reasons that aren’t entirely clear. DJ’s ploy works and after a public shaming by her betrothed, Hero melodramatically drops dead on the spot. In actuality she simply faints but Camp Leonato decides to let everybody think she has died while they work to prove that Claudio made much ado about nothing. It’s your basic romcom, essentially. As such it requires you to buy into that same premise that Romeo & Juliet and 95% of non-modern fairy tales ask of you. That true love is hella powerful and you need to take it as a given that these folk may as well already have a long established relationship for as invested as they are in one another after what in reality is such a short time. The St. Lawrence Shakespeare Festival’s production of Much Ado is grossly entertaining and worth making much ado about. Everything about it from direction to design just works. The entire cast without exception are outstanding in their roles and feel comfortable in their skin. Gabrielle Lazarovitz’s Beatrice and Ash Knight’s Benedict are especially delightful as they deliver their verbal barbs back and forth at whip speed in a duel of wits. Big highlights of an all round great time included the scene where Don Pedro and friends gossip about how Beatrice secretly loves Benedict while Benedict listens in and not so successfully hides in the background along with that scene’s counterpart where Hero and Margaret play the same ruse on Beatrice with her failing to do a good job staying hidden. In both cases, the others have the difficult task of pretending that they can’t see Beatrice and Benedict obviously bumbling around in the background. It was almost over the top to the point of being cartoonish but in a way that lent itself to the scene rather than detract from it. One of the things to love about live theatre is the sense that anything can happen. This is particularly true in outdoor theatre where the whole wide world may potentially intrude on your show. Or a hoppy little bunny might bound clear across the stage, drawing big laughs at one of the more dramatic moments of the show. Sorry, Antonio. Head out for an evening on the beautiful St. Lawrence and a greatly entertaining night at the theatre. Much Ado About Nothing is well worth the road trip. But that’s just my opinion and I’d love to know what you think. Beatrice or Hero? Did Claudio get off too easy, or will Hero get to hold this over his head for the rest of their days? Join the discussion below and tell me what you think.